Online accounting software, built for your business. Zoho Books is easy-to-use, online accounting software designed for businesses to manage their finances and stay on top of their cash flow. 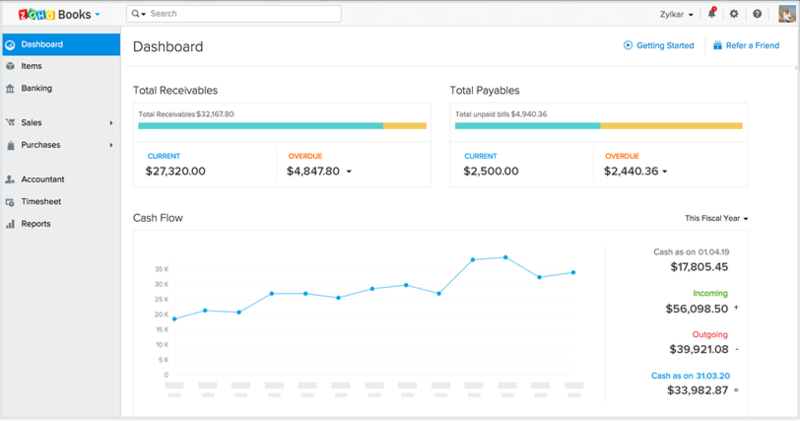 Easy-to-use cloud accounting software for businesses. Send professional invoices to clients and start accepting online payments. It's simple, fast, and convenient. Know the ins and outs of your expenses and save money in the future. Track, categorize, and bill them to your clients all from one place. Connect Zoho Books to your bank account and get a real-time update on your cash flow. Monitor transactions and categorize them instantly. Share recent transactions, expedite estimate approvals, accept bulk payments and capture customer feedback with the portal. Stay on top of your finances with powerful accounting reports like P&L, Balance Sheet, and Cash Flow Statement. Keeping track of your inventory is no longer a chore. Enable inventory tracking and manage goods as they come in and go out. Ideal for businesses across industries.